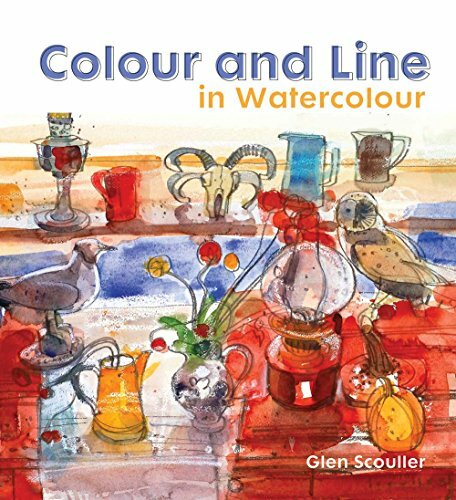 This is a lovely artbook by Glen Scouller, a Scottish artist living in Ayrshire. I was drawn by the expressive drawing on the cover to get this book. It's not a style that I see often when it comes to watercolour art but I enjoy looking at different styles. This is not the instructional book that I thought it would be. This is more of a personal gallery of Glen Scouller. The book only has a few demonstrations so if you're looking for step by step guidance you would be disappointed. Highlight of this book are beautiful mixed media artworks. Even though watercolour is mentioned in the book title, many artworks also use pencils, watercolour pencils and oil pastels. Because of the media used, the artworks are very textural. Watercolour pencils are used to create the lines, pens are seldom used. Oil pastels are used to create additional textures. The use of watercolour is lively and vibrant. Many artists like to use ink with watercolour, but in this book it shows how well pencils can work with watercolour. The text talks mostly about his experience as an artist, and what he looks out for when painting. The included artworks are accompanied by captions that talk about the inspiration. I like reading his personal stories on art, trips and subjects. While there aren't any lengthy instructions, Glen does explain the techniques that he uses. I could definitely see myself getting some inspiration from the style. If you like this book, also check out Zen of Drawing: Drawing What You See, Watercolor Journeys: Create Your Own Travel Sketchbook and other art travelogues.